So you’re home and you wake up with a sore throat one morning, the soreness goes away after about 20 minutes,” what was that?” You ask yourself, chances are it could be your in home air filter. Air filters require replacement every 20-30 days, depending on home environmental factors such as pets and smoking. The dirtier an air filter is, the harder the air handler will need to work to produce the same amount of cold air for your home. Air conditioning units could even freeze as a result of air filter neglect, and cost you thousands if you burn out the compressor, which will freeze the coils due to poor circulation – sound familiar? Checking your air filter is fairly simple and doesn’t require a lot of tools, usually a single screwdriver will remove the brackets, allowing you access to the filter. Changing the filter is easy and in most cases can be done by an eight year old. A great way to keep track of the age of the air filter is to write the date installed right on the filter. 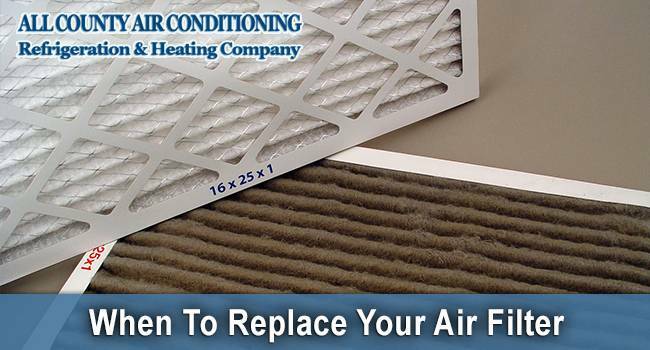 Check these filters once a week to ensure proper air flow and filtration before it’s too late! Do you need emergency air conditioning services? All County Air Conditioning is Fort Lauderdale’s Premier refrigeration and heating experts, located in the heart of South Florida. Our service technicians can respond around the clock for your convenience and comfort. We can service all makes and models of air conditioners, heaters, and furnace appliances. For over 35 years, All County Air Conditioning has been the leader in ac repair services and continues to provide the same quality industry standards and best practices to ensure continued results and growth. We are proud to stand by our work and guarantee all parts and labor with a no questions asked money back policy if you are not 100% satisfied.